Look at those ears! And, that face! 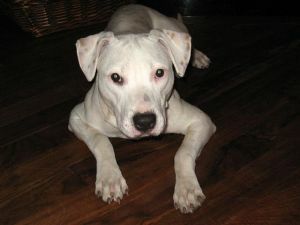 Aspen, a white pit bull terrier mix at the Chicago Pet Rescue, sounds like a dog’s dog — likes to go for walks, romps in the backyard and play a little ball. Learn more about Aspen on her Petfinder’s profile, and check out the full gallery of pets who are considered less adoptable. Previous Post Carteret Carnival – Dog Friendly!